Location of Rochelle in Lee County, Illinois. Rochelle is a city in Ogle County, Illinois, United States. The population was 9,574 at the 2010 census, up from 9,424 at the 2000 census. 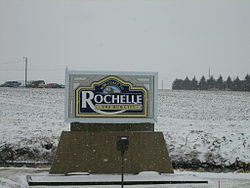 Rochelle is approximately 80 miles (130 km) west of Chicago and 25 miles (40 km) south of Rockford. Originally named Hickory Grove, the town sits at the intersection of two rail lines. Having a number of granaries holding corn, wheat and other crops for shipping eastward, the town was an important rail link for farmers. During the Civil War, an arsonist burned some of the granaries. He was arrested but vigilantes stormed the local jail and hanged him from a tree. The town then was called Hang Town by locals and travelers. Later in the local pharmacy, some of the city fathers were discussing the problem of lack of people coming to reside in the town. It was agreed a new name was necessary. One of the men reached up on a shelf and picked up a bottle of Rochelle Salts, saying Rochelle would be a good name for the town. After World War II, Rochelle grew, becoming a center for Swift Meat Packing and Del Monte canned vegetables such as asparagus, corn, green beans, and peas. Now the town hosts Nippon Sharyo, a Japanese maker of railroad passenger cars for commuter lines and regional corridor routes operated by Amtrak, as well as a meat packing plant owned by Hormel Foods. On April 9, 2015, parts of the city suffered damage after a large wedge EF4 tornado struck the town. Rochelle is located along the Kyte River (commonly, if inaccurately, known to most locals as "Kyte Creek"). It is also located near the junction of Interstates 39 and 88. According to the 2010 census, Rochelle has a total area of 12.919 square miles (33.46 km2), of which 12.9 square miles (33.41 km2) (or 99.85%) is land and 0.019 square miles (0.05 km2) (or 0.15%) is water. As of the census of 2000, there were 9,424 people, 3,688 households, and 2,415 families residing in the city. The population density was 1,260.9 people per square mile (487.1/km²). There were 3,895 housing units at an average density of 521.1 per square mile (201.3/km²). The racial makeup of the city was 86.81% White, 1.14% African American, 0.49% Native American, 0.92% Asian, 0.02% Pacific Islander, 8.69% from other races, and 1.93% from two or more races. Hispanic or Latino of any race were 19.16% of the population. There were 3,688 households out of which 33.4% had children under the age of 18 living with them, 49.7% were married couples living together, 11.1% had a female householder with no husband present, and 34.5% were non-families. Of all households 29.3% were made up of individuals and 12.1% had someone living alone who was 65 years of age or older. The average household size was 2.52 and the average family size was 3.13. In the city, the population was spread out with 27.1% under the age of 18, 10.1% from 18 to 24, 28.7% from 25 to 44, 19.6% from 45 to 64, and 14.5% who were 65 years of age or older. The median age was 34 years. For every 100 females, there were 97.0 males. For every 100 females age 18 and over, there were 93.1 males. The median income for a household in the city was $37,984, and the median income for a family was $46,563. Males had a median income of $35,890 versus $25,058 for females. The per capita income for the city was $18,139. About 7.6% of families and 10.4% of the population were below the poverty line, including 11.1% of those under age 18 and 4.3% of those age 65 or over. Rochelle is served by two separate school districts. Rochelle Community Consolidated District 231 serves Rochelle and limited areas just outside town. District 231 has four elementary schools serving grades K–5: Abraham Lincoln Elementary, Central Elementary, Floyd J. Tilton Elementary, and Phillip May Elementary. The district also operates one middle school, Rochelle Middle School, serving grades 6–8. Rochelle Township High School District 212 operates Rochelle Township High School. About half of the high school's students come from Rochelle and District 231; the remaining students come from a number of outlying communities, including Kings, Steward, Creston, Hillcrest, Esmond, and Lindenwood. There is also a private school named, St. Paul Lutheran School which enrolls children from the age of three, and up through the eighth grade. Rochelle Railroad Park has spawned many imitators, such as the Railroad Platform in Folkston, Georgia. For many years the Whitcomb Locomotive Works, founded by George Dexter Whitcomb, manufactured industrial locomotives as well as the Partin Palmer automobile, in Rochelle. Rochelle is also home to Union Pacific’s Global III Intermodal Facility. At the time it opened it was Union Pacific's largest intermodal facility. Construction on the state-of-the-art facility was completed in 2003. The Illinois River Energy ethanol plant is located in Rochelle. Rochelle owns and operates Rochelle Municipal Airport. Rochelle is known as the "Hub City" because of its location at the intersection of several major transportation routes. The first transcontinental highway in the United States, the Lincoln Highway, passed through Rochelle, as did US-51, one of the first highways to go the full north-south length of the United States. Both these roads have diminished in importance (and are now state highways 38 and 251, respectively), but Rochelle continues to be crossed by major highways, especially Interstates 88 and 39. Besides roadways, Rochelle is also crossed by two major rail lines; the Union Pacific Railroad and BNSF Railway mainlines cross inside of the city limits. The effect, as seen on a map, was one of the spokes of an old wagon wheel meeting at the "hub", and thus the nickname was born. Today, literally dozens of businesses carry the moniker "Hub City", including furniture stores, shopping centers, realty firms, dry cleaners, and many others. Even the local high school's teams are known as the "Hubs". Rochelle was once a stop for passenger trains operated by the Chicago, Burlington & Quincy, and its successor, the Burlington Northern, such as North Coast Limited. The town saw its last passenger train in 1971, and in 2007, the depot, which had been built in 1921, was demolished. ^ Severe weather: Tornadoes hit Iowa, Illinois, Ohio; CNN; April 9, 2015. ^ Tornadoes touch down, leave 1 dead in Fairdale; ABC7; April 9, 2015. ^ Malone, Frank (2003). "Design for decongestion". Railway Age. Archived from the original on 2012-07-11. ^ "About Lorenzo – Psychedelic Salon Podcasts". psychedelicsalon.com. Retrieved 2018-11-13. 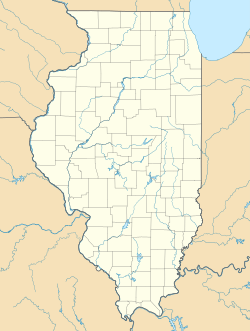 Wikimedia Commons has media related to Rochelle, Illinois. This page was last edited on 19 April 2019, at 01:25 (UTC).